The Additional Counter Set is an expansion for the most dedicated Sails of Glory enthusiast, useful to play battles with more than 10-12 ships. This accessory includes a set of counters, similar to the set included in the Sails of Glory Starter Set. It includes hundreds of high-quality cardboard counters, and also included are the plastic stands required to build two attitude indicators and the wind gauge. Do you want to play huge Sails of Glory battles, or just replace the damage counters and special counters included in the Core Set? Do you need multiple attitude indicators to assess the wind when playing multi-player games? The Additional Counter Set is the answer. 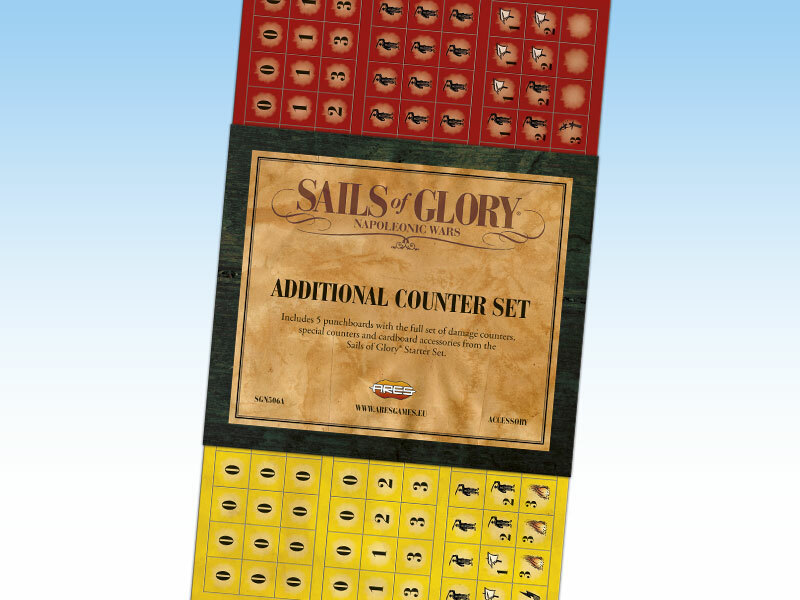 The Sails of Glory® Additional Counter Set is an accessory, designed to be used with the tactical ship-to -ship game system created by Andrea Angiolino and Andrea Mainini.